Our CORE Gymnastics Team is a group of advanced CORE gymnasts who learn individual routines based on specific requirements in order to compete at gymnastics meets and perform at community events such as Touch-A-Truck, festivals, sporting events and other similar exhibitions. The goal of our Team is to teach gymnastics skills in a semi-competitive environment through loving discipline and dedication to the sport. 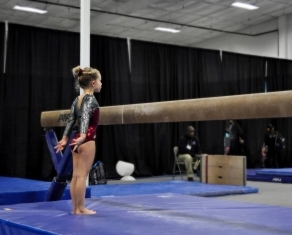 Coaches support athletes in their pursuit of competitive excellence to help gymnasts fully develop to their personal bests. This class is designed for girls ages 3-5 who have a solid command of fundamental gymnastics skills. Students will focus on improving gymnastics technique, flexibility, strengthening, and conditioning. Instructors will introduce skills such as handstands, cartwheels, roundoffs, back walkovers, pullovers, back hip circles and tap swings on the high bar, giving students the opportunity to experience more progressive gymnastics and develop the skill set needed to begin basic routines. This program requires an invitation by CORE coaches after at least one 8-week session in a different class. 60 minutes. CORE's very own gymnastics team! Students will have the opportunity to experience gymnastics competitions and perform as a team at community events. Students will learn assigned XCEL routines and will compete or perform several times throughout the year. This program requires an invitation from a CORE coach after at least one 8-week session in a different class. CORE's very own gymnastics team! Team gives students the opportunity to experience gymnastics competitions and perform regularly as a team at community events. Students will learn assigned compulsory routines and will either compete or perform using these routines several times throughout the year. This program requires an invitation from a CORE coach after at least one 8-week session in a different class. Please contact CORE for scheduling and pricing information.